About This DVD: Indian culture extols Satyam (ultimate reality), Shivam (eternal goodness) and Sundaram (universal beauty). Yoga, one of the gems of this ancient culture, worships the Divine through “living the Life Beautiful”. Staff and students of Yoganjali Natyalayam, Pondicherry, India present their Yoga skills mingled with soothing music creating a Reality, Goodness and Beauty (Satyam-Shivam-Sundaram) that is a joy forever. 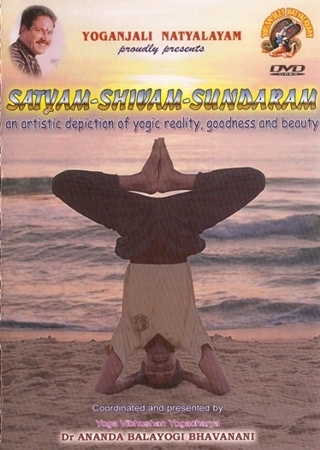 Various Yoga practices of different levels of difficulty are depicted with stunning visuals shot on the lovely red earth and virgin beaches of Pondicherry, South India. A highlight is the courageous performance of Yogasanas on high hillocks as well as the meditative performance of Yogasanas with a lighted candle balanced on the head. This unique presentation is a treat for the eyes and will linger in your mind for a long time, inspiring all fortunate enough to view it to implement these high yogic ideals in their own lives. Coordinated and presented by Yoga Vibhushan Yogacharya Dr Ananda Balayogi Bhavanani.